Q: I am going to build an addition to my main home. I am using earthbags to build the walls. I am going to build a rubble trench. The walls will be load bearing. The addition will be round with a masonry stove in the center that will be load bearing as well with timbers running off masonry stove to the earthbag wall. I live in N/W Indiana. I also want to double stack the wall. Kind of like when staking hay bales in your barn. The first row will have two rows of bags placed end to end in a full circle. The row after that will be bags placed side by side. What do think about my plans? A: I think that your idea to make a double wall makes a lot of sense, especially if you were to fill the outer bags with an insulating material, such as crushed volcanic stone, perlite, vermiculite, or rice hulls. The inner wall then would become the load bearing one, and the outer wall would provide the needed insulation to make you home truly energy efficient. As an alternative to this, you might leave a gap between the rows of bags, so the the inner space could be filled an insulating material. Q: I am wanting to have as much mass as well as insulation in my house. Would it work to fill the bags halfway with earth and then finish off with the pumice. Then lay them with the pumice on the outside? I was thinking about doing 2 separate rows, but my helper suggested that I find out if this idea would work. A: The problem with filling and laying the bags the way you propose is that they will not form a very solidly interlocked wall with a running bond (like bricks). There is another approach that resembles what you describe shown at earthbagbuilding.wordpress.com, but this idea has not been tested to my knowledge. Two separate rows will also work. I provided mass in my earthbag house with flagstone flooring, bags of sand in strategic places in the interior, such as in columns supporting the door, a landing for steps, a curving sandbag staircase, etc. It is possible to have too much mass inside, in which case it can take a long time to get up to a comfortable temperature. Q: Our soil at the house site (in Grenada) is primarily red clay. We have done some soil tests and it seems to be just about right and will create a strong structure when complete. But we are concerned about the interior temperature and humidity levels. Volcanic gravel is widely available and can be delivered to our site, though this involves added expenses and the extra labour to bring the gravel uphill from the driveway. But what is the best choice clay soil - or - scoria...? A: I see from a quick Google search that Grenada is definitely tropical, with an average temperature of 82 degrees F. and rain much of the year. While scoria provides excellent insulation, this advantage will eventually be overcome by ambient temperatures in the tropics I think. Even with lots of thermal mass on the inside of the house being insulated from the outside heat, what will keep it cooler over time, especially if the nights don't cool down all that much? I presume you want to keep away from running air conditioners, so the insulation might not do you all that much good. I have always thought that one good way to combat the heat in warm areas would be to dig into the ground to take advantage of the cooler temperatures below the surface. I know that you are planning to berm one of your walls with about 4 feet of soil, so that should help a lot. In this case, you don't want that wall to be insulated, because that would keep that cool from entering the house, and you definitely want the berm directly up against the wall without any insulation. Patti Stouter has made a study of building earthen structures in tropical areas, and we have several of her papers available to read, so you might take a look at these and see if any of her strategies make sense in your situation. As for humidity, I know that earthen walls and plaster can help deal with this quite effectively, so for that this reason filling your bags with soil and using an earthen plaster on the inside would be a good idea. Soil can actually absorb a great deal of humidity without being adversely affected. Q: I was wondering if spraying foam insulation on the outside of the earthbags would work well? I'm guessing the main reason not to do is environmental (using polystyrene)? How about soy-based spray foam? It could then be topped with a more weather proof coating like stucco, etc.. Wouldn't this solve the insulation issue? A: I don't see why this wouldn't work. The Monolithic concrete domes are insulated this way. Q: I was thinking about stuccoing my house with concrete stucco because it is more waterproof than earth plaster. Dunedin rains a lot. If I did would I need extra insulation between the stucco and the earthbags? A: This depends on your climate, the design of the house, and what the bags are filled with. In anything other than a very moderate climate, it is usually better to provide some form of insulation in the walls. This means either filling the bags with an insulating material (such as crushed volcanic rock) or adding a layer of insulation to the outside, as you propose. Q: Earthbags, like other masonry, fits into the dry tropical areas as an excellent climate responsive material to create indoor comfort without artificial temperature controls. The humid tropics have other constraints. I am a volunteer designer working on training centers for national literacy workers and translators with Wycliffe Associates. Many of our projects are in the humid tropics. Termites often find ways through floors to devour wood structures in walls. Walls need to hold little heat to prevent condensation between night and day temperatures in the very high humidity. Insulation to keep out high daytime temperatures is a plus. A: Very thick earthen or masonry walls will work in some hot, humid climates (if they aren't too hot), as they tend to create a very stable temperature over time. Condensation is usually only a problem when warm, humid air makes contact with a much cooler surface, and such walls are not likely to be that cool. But I agree that a fully insulated wall is really the best, and this can be achieved with earthbags filled with pumice. Termites are not interested in any of this. Q: I've recently acquired some land in southwestern Alaska and have been thinking about various options I have for building a small dwelling there. I'd like to do something simpler than the usual log cabin, and I was looking at your earthbag structures and wanted to ask if you thought a small earthbag dome would be good for such a place--the average January temperatures are in the teens and 20s, though it can get well into the negatives during a cold snap. And there is usually about 25 inches of rain per year and 65 inches of snow. If an earthbag dwelling seems feasible, would you recommend increasing the width of the walls? I think the shape would be fantastic for shedding rain and snow. Also, do you think the walls would be strong enough to be partially submerged (i.e. berming up to several feet around most of the structure)? Also, would you recommend using something other than papercrete for the exterior? I really do like the earthbag idea a whole lot, and I'll want to use as much local material as possible. The other approach to insulating the dome is from the outside once it is made. I did use a papercrete plaster on my dome, and this is also good insulation, but only if it is kept dry...and that is hard to do since it absorbs water like a sponge. Spray foams are another option, but most of these are not so natural. Lightweight concrete stucco might work, but again you need a source of lightweight aggregate. So you have some choices and possible trade-offs to consider here. Q: Here in Panama we have the advantage that we don't need to worry about cold weather, so I am not sure if the bags you propose to be filled with earth (for thermal mass) on the Baggins Burrow design serves such purpose (insulation against cold?). A: You may not have much cold weather in Panama, but you certainly have a fair amount of heat, and this is where all of that thermal mass will serve you well, in helping to stabilize the interior temperatures and not get too hot inside. It works both ways. Q: I am planning to build eco domes in the Caribbean. I read that using a lot of dirt gives it more thermal mass and less insulation. It is hot and humid here so what do you suggest? A: You're right that dirt provides more thermal mass and less insulation. The best situation in most climates is to have both thermal mass (on the inside) and insulation (on the outside), but this is not so easily done with earthbags. Since they are so thick, you end up with a lot of thermal mass material if you use dirt, which tends to even out the temperatures inside over time, and make the home more comfortable. Thinner brick or concrete walls will radiate the heat much more. The best situation is to recess the home into the ground some, or berm soil up around it to help keep it even cooler. The other way to go is to fill the bags with an insulating material, such as rice hulls or crushed lightweight volcanic stone. This will insulate the enclosed space better from the outdoor heat, and then if you also include thermal mass materials (heavy stone or tile) inside, then the house will be especially comfortable. Adequate ventilation is important in any case. Q: I have a question about earthbag homes. For your scoria-filled Riceland earthbag dome, I'm curious to hear what you did for thermal mass given that the bags were filled with insulative material. Are scoria-filled bags enough, or do you find that more thermal mass is needed? I ask because I'm planning an earthbag house in the mountains of New Mexico where the temperature varies quite a bit from season to season, so I'm wondering if scoria would be enough or if I should plan for two layers, one filled with earth and the other filled with scoria. Would single bags sewn off for 4 or 5 inches worth being scoria work better? Essentially, what is the right balance of insulation vs thermal mass? And how can one go about figuring this out for one's climate? A: Actually, since that dome was not intended as living space, we weren't too concerned about the balance of mass/insulation. However for the house, which was also primarily built with scoria filled bags, we made sure there was plenty of thermal mass in various places throughout the structure, including the flagstone/adobe floor, earthbag stairs and landing, and interior columns. You could build with two layers of bags as you suggest, but that much mass is usually not needed. In your climate, the insulation of the scoria is more important, and you would want the full thickness of the bags for this. For a more technical discussion of the proper balance of mass and insulation, I recommend Ed Mazria's book: The Passive Solar Energy Book: A Complete Guide to Passive Solar Home, Greenhouse and Building Design by Edward Mazria, 1979. Even though this book would seem to be dated by its publication date, I still consider it to be one of the best all-round guides to passive solar design, whether for home or greenhouse or both. I often refer to my tattered copy of this book when I want to know what the experts think. Ed is an architect working in New Mexico. Q: My idea is to fully berm three sides and insulate the Southern side and the ceiling which would both be stick framed. A: The thing about an uninsulated berm like you propose is that it will continually try to bring the temperature inside the house down to its level (around 50 degrees F. perhaps) so you will need to supply heat much of the time to compensate. The Earthships use large berms like that, as do PAHS (passive annual heat storage) designs, but they still insulated the berm itself at some distance around the shell of the house. You could also do this, using easily transported sheets of rigid insulation if you want. It can take a year or so before that bermed soil becomes sufficiently charged with heat to be noticed much, however. Q: I should have no problem getting volcanic stone here in Ottawa. Should all the bags of the building be filled with the volcanic stone ? I was curious if it would be any advantage to build the exterior walls double thick with the outside bags having say soil in them and the inside layer having the volcanic stone ? Or perhaps with a layer of foam in between the double thick wall? A: That is convenient that you are able to source the volcanic stone. In the house that I built, I used bags of scoria in all locations that made direct contact with the atmosphere; there were other places, such as interior buttress columns, stairs and landings where the bags were filled with soil. You could certainly build a double walled home, and it would likely end up very thermally efficient, but this might be overkill in terms of time, expense, and space. Most well-designed passive solar homes don't need as much thermal mass as that would create and there are easier ways to incorporate what is needed. In any case you would want the exterior to be insualted and the interior with thermal mass. Q: My wife and I live in Arkansas. The climate is mild but has a hot, humid summer. We want to build an earthbag house with at least two sides, the Northern and Western, bermed. We also want an earth-sheltered roof. We are concerned about moisture issues given the climate, and about the structural integrity of the living roof designs we have seen, if we try to construct any of them on earthbag walls. Most of the earth-sheltered roof designs we have seen are concrete poured. We will be building a house for a family of seven, and would like to make the most economical choice as well. We are open to building above ground, as well, if that is more economical and or less complicated with comparable comfort from the summer heat. How does perlite work out with a living roof/berming? We also have a large amount of pure silica sand--would this be a good bag filler? What suggestions do you have concerning these issues? A: Living roofs are nice but they do require a much heavier duty support structure, which can be more expensive. The soil on these roofs provides only a modicum of insulation, so even with earth-sheltering there is a need for additional insulation. So a very well insulated, light weight roof can be both cheaper to build and very comfortable in your climate. All of the benefits of berming the sides of the homes can still be employed. Perlite is somewhat unknown as a fill material for earthbag building. I say this because I actually don't know if anyone has tried it yet, although theoretically it should work fine. I would think that perlite walls would benefit from a lighter weight roof structure as well. Pure silica sand is a poor insulator, but good thermal mass, so it can be used in areas where this is considered. Some sands are very slippery and don't pack into solid forms very well, so be careful to do some tests with it to see how well it packs. It may be necessary to add some clay to the mix the get it to form solid blocks. Q: I was somewhat discouraged to learn that earthbag type construction is not as effective in colder climates such as we get out here on the northeast prairies of Colorado. I have read about the dividing a bag down the center to use insulation in one half and earth or volcanic rock in the other. This technique does not lend itself to filling bags with a Bobcat style bag filler as shown on one of your fine links. As I looked at the options I thought that we might make the earthbags work along the lines of "double panel precast concrete". The way I see it we could place a 2 foot wide (or what ever width would match the bags stacked to close to 2 ') 8 foot long sheet of rigid foam board laying on its side and bag equally down the length and up the side. Once the top of the board was reached, place a U shaped rebar staple straddling the insulation long enough to reach the center of the earthbags and spike in place. I would guess that one of these saddle type staples every 2-4 feet would be enough to hold the inner and outer wall sections to each other. I know that this effectively doubles the number of bags needed, but perhaps it would be worth it. The one thing that I can see right off as a down side is that this would probably force us to use only straight wall floor plans. I do not think the rigid insulation bends well enough to allow for use of the beautiful curved wall designs. Does this seem to be a reasonable idea? A: Earthbag building can be very effective in cold climates, as evidenced by the earthbag house that I built in the mountains of Colorado (over 8,000 ft.), not far from you. I filled the bags with locally available scoria, a lightweight volcanic stone. Other possible insulating fill material is perlite and rice hulls. I think that you could also do something similar to your suggestion of embedding insulation panels between two rows of bags, but the thicker, better insulating, panels do not bend much. For that matter, you could even make just one wall of bags filled with soil, and then insulate it with commercial foam on the outside, and this could be done with any shaped house. 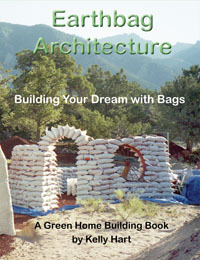 Q: I've recently been interested in building my next home with earthbags. I was wanting to build an octagonal room with straight walls and traditional roof. I live in sw Missouri, and am trying to figure out what to fill the bags with. I want to partially berm the back half of the octagon. I know scoria is suppose to be great for insulation, but I was wondering if I could use different fillers. For example, scoria in the bags in the front half and local soil in the rear half that is going to be bermed. I wanted to have a loft as well so I know it needs to be load bearing. Would this work or would that defeat the purpose of using the scoria? Scoria isn't easy to find here either. We usually have mild winters, and hot humid summers, but there is the potential for very cold weather at times. Missouri is notorious for strange weather. Any input would be great. A: You could do what you suggest with scoria in the front and other soil in the bermed portions, but you would probably be leaking heat energy into that berm over time. The subsurface temperatures in Missouri are around 58 degrees F., which is a bit cool for most people. For this reason it would be better to have that wall insulated with scoria as well. It is possible to insulate the bermed wall with some commercial foam insulation though, so that is another option. In this case the soil-filled bags would serve as internal thermal mass, which is a good thing. Bags of scoria can be load bearing; just make sure that they get tamped well. Another kind of insulating material that you could fill the bags with are rice hulls, which I believe are available in your area. Unfortunately these are not so stable in load-bearing situations, nor good to locate in bermed areas. Q: I am considering building a small earthbag home and have been reviewing what lightweight aggregates are inexpensively available in my area. It occurred to me that the "bottom ash" produced in coal combustion furnaces would probably make a good lightweight aggregate and provide some insulation value. I later found that it has been used experimentally to add insulation to rammed earth structures. Any thoughts about using this material to fill earthbags? I was thinking of a double-walled structure with the outside walls made of bottom ash filled bags and the interior walls made of native soil or trucked-in sand for nice thermal mass. A: This sounds like a good idea to me. I am not totally familiar with the "bottom ash" that you describe, but it could be an excellent insulating building material, especially if it is lightweight (full of air pockets). Doing a double wall with this on the outside and soil on the inside should provide an extremely comfortable, energy-efficient home. Q: I am starting a music studio in my basement and thought of building the dividing walls out of sandbags. Do you have any experience and tips for me with regards to building sandbag walls (straight or slightly curved) up to a concrete ceiling? A: Bags of sand are very HEAVY, so make sure that the floor can support them; a concrete floor in a basement is probably fine. Especially for a music studio it might be better to fill the bags with rice hulls, straw, or volcanic rock to better absorb the sound rather than bounce it. If you curve the wall a bit it will be more stable. Q: I've got access to material on my site but its mostly sand/gravel....not much clay. What are your thoughts on this with respect to thermal mass and insulation. I live in Central Texas where the average annual temperature is about 65 degrees with summer temperatures reaching into the 100's. My main objective is too keep the structure cool (75 degrees preferably). I may have an option to get a sand/clay mixture delivered. Would a mix if 80% (sand) 20% (clay) suffice? Or what would be your recommendation? Or perhaps any other fill material given my location/objective. A: Sand and gravel are good thermal mass materials, but provide very little insulation. In your climate the space without further insulation would likely get hotter than you like and remain so, especially during the summer. My recommendation is to dig into the ground (or at least berm more soil around the walls of the house) and take advantage of that average 65 degrees year round. An 80/20 ratio of sand to clay would be great for earthbag work. If you wanted to build with insulation, then you might consider filling the bags with crushed volcanic stone (scoria or pumice) or even use rice hulls. Or, you could place some other insulation on the outside of the soil-filled bags to keep the thermal mass inside and buffer the outdoor temperature. Q: I would have thought that with such thick walls there would be enough insulation to keep it cool inside...but if I understand you correctly, it just keeps the heat in? If we do need added insulation, what do you recommend for this? A: Well, thick walls of earth do insulate some, but earth is much more a "thermal mass" material that holds heat or cold over a long period of time. This means it can act as a moderating factor for the indoor temperature. But if it gets hot during the day and doesn't cool off much at night, then the walls will continue to build heat and become uncomfortably warm. That is where insulating the thermal mass from the outside works to isolate the hot air from the relatively cooler inside, and then it can remain quite comfortable inside. This insulation could be commercial foam panels, or even small bags of rice hulls. Q: I was wondering if you have had an opportunity to work with rice hulls at all. My husband and I are building a home next spring out of earthbag tubes and rice hull bags\tubes combined, one in front of the other. I believe its called thin wall earthbags. I know it sounds intense but I am looking for stability without having to use more timbers plus insulation value because we live in middle Tennessee where the winters are fairly cold some nights. One "expert" told me to use the rice hull bags only but put up support beams or rebar often. but isn't that kind of defeating the purpose of building with the earth in mind? rebar and concrete are man made materials and I would much rather have the earth supporting my home. I will be using natural timbers in the corners and a few supports for longer walls. Just curious what you think. A: I think that your plan is excellent. I have often thought that such a combination of bags of insulation on the outside and mineral thermal mass bags on the inside would make the best wall possible in most any climate. noise reduction, thermal mass properties and breathability factors. Some have said that this way with proper method and compaction, an exterior application of adobe mix with a nearly 2 foot thick wall would give you R-40 or so. Do you agree? A: The short answer to the R-value of Dirt - about R 0.125 to R 0.25 per inch. So a 15 inch thick earthbag wall filled with compacted soil would be between R-2 and R-4. Of course because it is thermal mass, this will affect the thermal dynamics as well. Q: I'm living in the south of France and am quite fed up with the politics and laws forcing us to build expensive houses via contractors and loans. Therefore, I'm very interested in building an earthbag house... Concerning insulation, do you have tips? A: The question of insulating an earthbag house is somewhat complex. In some moderate climates without many extremes of heat or cold it is possible to be comfortable in a house with the bags filled solely with soil. Because this is thermal mass it tends to hold its temperature for a long time. Otherwise, you can either fill the bags with something that provides insulation (like crushed volcanic stone, perlite, or rice hulls) or you can place another insulating layer on the outside before it gets plastered. Another option is to build primarily underground, or at least with soil bermed up against most of the walls, and this essentially isolates the building from the ambient temperatures. In this case, in France, you might need a modest amount of heat to be comfortable, and this could be provided primarily through passive solar. Q: I an considering a retirement place in Belize. When looking into building, the "preferred" material is reinforced concrete. That is great for the occasional hurricane, however, the constant heat makes these homes a big brick oven for the rest of the time, unless you are constantly running the (really expensive) AC. When I was a kid, I lived in an adobe home and that got me on the path where I stumbled on earthbag, which looks like a great option for coastal Belize. A: An earthbag house can be just as energy inefficient as a concrete one (or an adobe one for that matter); they are all basically thermal mass materials that will slowly pass the heat through to the inside and hold that heat for a long time. They all need to be insulated on the outside in a warm climate to be comfortable. It is possible to fill earthbags with insulating materials (such as crushed volcanic stone) to make an insulated wall. My suggestion would be to consider an earth-sheltered design, that is largely dug into the ground, or at least have the walls bermed with soil. This can make a huge difference in the comfort and energy efficiency of the house. Earthbags are very well suited to this approach to building. Q: What sites are best suited to building with earthbags? Which are border line and would work with some adaptations. Are there any you avoid altogether? A: The best sites for building with earthbags are those where the climate favors the use of the local soil as fill. This means that the climate is moderate enough to not require extra insulation to create a comfortable abode, whether building above ground or below. Practically any site can be suitable for earthbag building if you can locate appropriate insulating fill material, such as crushed volcanic stone, pumice, perlite or rice hulls. One should consider building an earthbag dome only in rather arid climates; otherwise there is the risk of possible leaks undermining the structure.